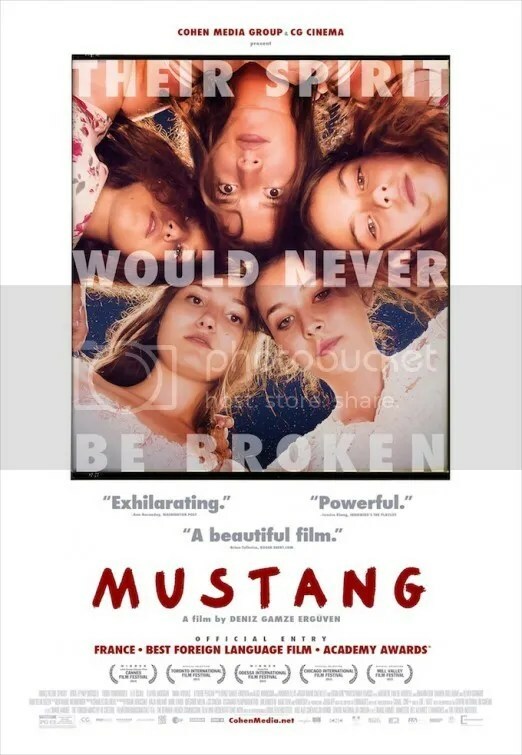 Mustang is set in a remote Turkish village and depicts the life of five young sisters. Our tale concerns them all but is more centered on Lale (Güneş Şensoy). Her teacher at school is leaving for Istanbul. After saying goodbye, she accompanies her sisters on the walk home during a beautiful sunlit day. On the way, they stop off at the beach. They join some of their male classmates in a water game, fully clothed incidentally, where they sit on the boys’ shoulders trying to knock each other off. A neighbor spies the impropriety and the news of their seemingly innocent game reaches their family. The five orphaned teen sisters live with their grandmother in an isolated town on the Black Sea. She along with their overly protective uncle Erol (Ayberk Pekcan) are shocked. Their harmless goofing around is viewed as licentious behavior. The incident has lasting repercussions on the girls’ life from that moment forward. Deniz Gamze Ergüven is a Turkish female director born in that country. However she was raised in France and is currently based there. As such this picture was nominated as the French entry for the Best Foreign Language Film at the 88th Academy Awards. In a broad sense, the chronicle is about freedom. More specifically the accessible subject concerns the unique challenges that girls face growing up in a conservative Muslim society. The narrative does a good job at detailing how their home life transforms after the event. They’re given virginity tests and forbidden to leave the house – even for school. Soon after their uncle intends to marry every single one of them off as soon as possible. As the 5 sisters band together under the tightening restraints of their domesticity, their sisterly bond is captivating. They exhibit a camaraderie that is touching – a pretty, free-spirited group on the precipice of burgeoning sexuality. However, the group behaves as a unit and that often makes it hard to differentiate one sister from the other. Only the youngest, Lale (Güneş Şensoy) who narrates the story, truly stands out. Director’s Deniz Gamze Ergüven’s harsh critique of an oppressive patriarchal society is straightforward, but it isn’t subtle. The saga descends from the carefree optimism on the beach into the dark corruption of a community prone to gender bias. The essential “house arrest” of these 5 teen girls approaches the totalitarian conditions of a jail. The nightmare that is their homelife is clearly evident. Their subjugation is infuriating. As Westerners we are forced into a judgmental corner and are predictably outraged. The cultural portrait is nicely presented. This makes the decision to further stack the narrative by also making the uncle sexually abusive, a bit ham-handed. The focus isn’t just about the tyranny of a culture unjust to women anymore. Now we’re dealing with sexual assault. The approach is unnecessarily embellished. We feel the forcible pull of a screenplay, co-written by the director and Alice Winocour, overstating its case. However as the debut feature from an up-and-coming filmmaker, there’s still a lot to admire here. This entry was posted on January 17, 2016 at 7:14 pm and is filed under Drama, Foreign with tags 2015. You can follow any responses to this entry through the RSS 2.0 feed. You can leave a response, or trackback from your own site. I really really want to watch this one but can’t seem to find it anywhere! Just looking at its plot is enough reason to get me excited. Good review! Son of saul is another I’ve been hearing great things about! I’m seeing it today. Review to follow soon! Interesting, Mark. I’ll have to wait to rent it as it’s not featured anywhere by me. Nice review. It’s in 57 theaters now but it should expand wider in the weeks leading up to the Oscars on February 28th. I create a new post from scratch every time. There’s not a lot of formatting involved. Just the text with the poster and star rating. It takes about 15 minutes to put together. Now writing the review itself. THAT takes quite a while. An important films that almost demands to be seen. The Oscar nomination assures that, but it’s easier to admire than to enjoy. You’re right that Mustang isn’t subtle, but I still loved it. I laughed a lot and I really dug its critique of patriarchal societies. Plus, I really liked its main character, who doesn’t take s*** from anyone. Her rebellion leads to a delightful f**** you kind of ending. I didn’t laugh. I found the portrait of 5 sisters fighting for their freedom rather painful. I liked this more than you. I’m always amazed when seeing different cultures in movies. I felt sorry for the sisters, but also enjoyed them. They seemed to have a great relationship together. 4 stars. It had some interesting aspects. A curious window into another culture.